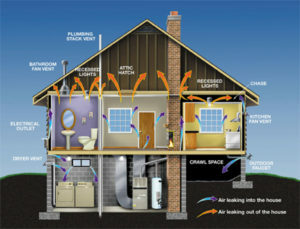 In order to keep your house cool in the summer and warmer during the winter, your home requires proper insulation. An inadequately or improperly insulated roof will allow heat to escape, wasting energy and costing you money. During the summer months, a poorly or improperly insulated roof can also trap heat in your ceiling or attic and make your house seem stifling. Our experienced installers are capable of working on all kinds of roofs including gabled, metal, flat and tapered. We supply and install a variety of insulation types including rigid foam, spray foam and siding insulation, so we’re sure to have the right material to suit your home. At Weatherize Alaska, we are a full-service roofing insulation company offering design, installation and repair service at competitive rates. Our experience and relationships with manufacturers allow us to offer unbeatable prices on all materials and labor. We are fully licensed, fully insured, and fully committed to completing all projects within your budget and schedule. So when your roof needs insulation, count on Weatherize Alaska to meet your performance needs and stay within budget.